Mixology Monday is a monthly cocktail party where various bloggers post recipes using a featured ingredient. This month features absinthe and is hosted by Sonja Kassebaum over at Thinking of Drinking. Absinthe has enjoyed quite the revival since its reintroduction to the U.S. in 2007, having been outlawed since 1912. I picked up a bottle of swiss-made Kübler Absinthe and set out on my adventure with la fée verte. My first inclination was to make an absinthe-heavy cocktail, however, I soon realized that doing so would result in a drink I would not enjoy. Absinthe has a strong flavor that easily overpowers other ingredients which is why it is used in small amounts in most cocktails. I thought it wise to keep that in mind when working on my concoction. 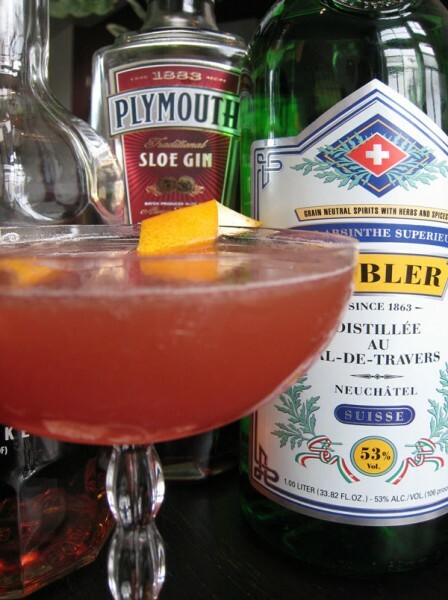 Using the Remember the Maine cocktail for inspiration, I looked to create a rye-based drink that could utilize Sloe Gin, (a gin-based sloe berry infused liquor), along with a dash of absinthe. Shake ingredients, strain, squeeze the zest of a lemon on top, garnish and enjoy! As you can see, I used very little absinthe yet its flavor comes beautifully in the cocktail. The rye and sloe gin match up well with the lemon which balances things out quite nicely. The flavors together add quite a layer of complexity that finish off with subtle notes of caramel. Looking forward to trying your ‘maraschino’ cherries too! Thanks for the kind words, hope you enjoy the rest of the blog! Adventures in Cocktails © 2010. All Rights Reserved.